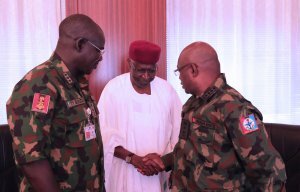 President Muhammadu Buhari along with the service chiefs and the Inspector-General of Police, Mohammed Adamu, Tuesday in Abuja reviewed security challenges at the February 23 presidential election and resolved to enhance security situation at the March 9 governorship election. 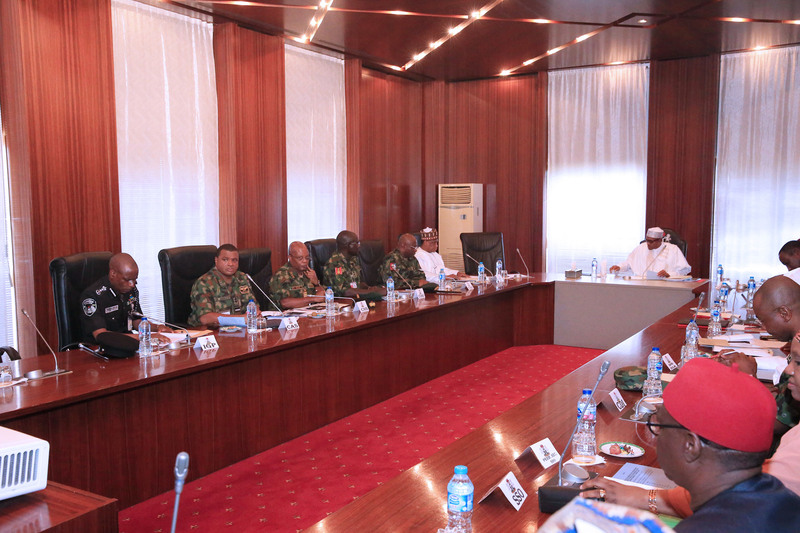 At the security council meeting held in the State House and presided over by the president, the Chief of Defence Staff, General Gabriel Olonisakin, Chief of Army Staff, Lt. Gen. Tukur Buratai, Chief of Naval Staff, Rear Admiral Ibok-Ete Ekwe Ibas, Chief of Air Staff, Air Marshall Abubakar Sadique and IGP Adamu were in attendance. Briefing journalists at the end of the meeting, the IGP who congratulated Nigerians on what he described as the peaceful conduct of presidential and National Assembly elections last Saturday, said machinery had been put in place to enhance security measures provided last Saturday. The IGP reiterated his earlier threat ahead of the presidential election that thugs, ballot box snatchers and touts would be severely dealt with during the governorship election and hence, advised those contemplating such criminal acts to have a rethink. He said, “We are all aware of the fact that we just concluded the presidential and National Assembly elections and we want to congratulate Nigerians for the peaceful conduct of the elections and we are prepared now for the governorship and the House of Assembly elections in the country. “So, thuggery again, is not allowed. Ballot snatching is not allowed. Disruption of the election process is not allowed. We, the security personnel have resolved to deal ruthlessly with anybody that attempts to disrupt the process of this election. For that reason, we expect that in every state, the conduct of the election should be respected. “We expect that electoral materials must not be tampered with. We expect that the INEC officials would do their work without fear or favour and without being allowed to compromise. 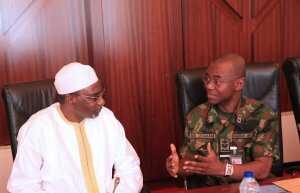 Adamu who also disclosed that a number of thugs and ballot box snatchers were arrested during the presidential election, added that the security council had noted some states such as Bayelsa which he said were prone to violence and consequently taken adequate steps to deploy more security personnel to such states. 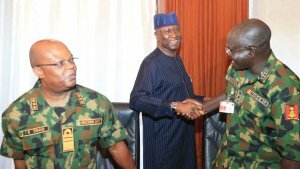 He also disclosed that the intelligence capacity deployed to such flashpoint states had been increased with a view to identifying trouble makers before executing their plots adding that security would be provided for Nigerians who will vote during the polls. “We’ve made a number of arrests all over the country but probably we shall come out with the number of arrests we have made in terms of those that disputed the process of the election in some areas within the country. We’ve made a lot of arrests. Virtually, in Bayelsa, and there are other states within that zone that we have taken notice of the fact that people there are prone to violence. So, we have increased the number of security personnel that have been posted there. “Also, we have increased the intelligence output that have been posted there so as to help us identify those people that are trying to cause problem so that we can take them out of the environment before they cause the problem. 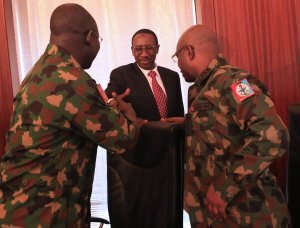 Therefore, there is increase in security personnel. “Well, as I said before, the lives of Nigerians are secured in terms of provision of adequate security to come out and vote,” he stated. On those arrested during the presidential poll, the IGP said the suspects were currently being investigated by a team of police headed by the Commissioner of Police in charge of legal matters adding that at the conclusion of the investigation, the police will collaborate with the electoral commission to prosecute them. “Investigation is ongoing. There is an investigative team that has been setup headed by the Commissioner of Police in charge of legal (affairs). They are compiling the case files. They are investigating them. At the end of the investigation, the police in liaising with INEC will prosecute them,” he added.